A farmer who relies on his crops for a living will plow and plant his fields in order to receive a good return at harvest time. It is not enough to have a bounty of sunshine, rich soil or adequate rainfall. He has a role to play. The real risk, however, is in the gamble with the weather. The hopeful farmer can spend toilsome hours preparing his acres and still yield nothing in a season of drought or flood. Such is the music industry. Many artists and bands enter into it with high hopes of building a fan base and traveling the world, but find that they don’t end up traveling so far from home and their only avid fans still put new socks in their stockings. Success, as in the fields, is dependent upon many variables. 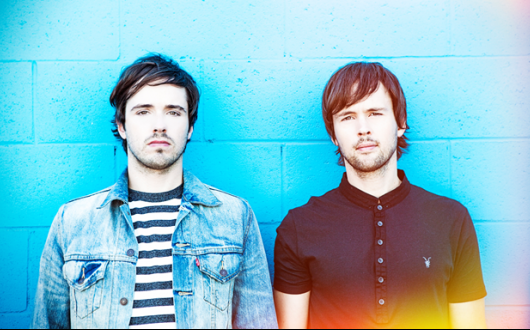 In the case of Atlas Genius, a four-piece band from Adelaide, South Australia, that variable was timing. I first heard of Atlas Genius last spring when my friend, Jordan, returned from spending a few months in Australia. She played a song called ‘Trojans’ through her iPod dock and said that this band was blowing up over there. The song was contagious and attached itself to the inside of my skull. After learning a little more about them, I found out that they had almost called it quits and were going to return all of their focus to school. However, their springtime arrived just in time. Dozens of record labels began to contact them and after spending last spring in the states, themselves, they decided to sign with Warner Bros. Their debut EP, “Through the Looking Glass”, continued to receive warm welcomes from new fans worldwide. Keith Jeffrey, Michael Jeffrey, Steven Jeffrey and Darren Sell took a different approach than most bands in the making of the album. For two years, they spent their days building their own studio that fit to their likings, and played shows at night covering songs by bands like The Police and The Beatles. “We had a lot of song ideas and it was important to us to have our own studio where we could experiment and hone in on our sound,” drummer Michael Jeffrey shared. Just a year later, their lives have drastically transformed. They are beginning to be a common name on iTunes charts, they are selling out most of their shows, and they have recently finished their first full-length album, titled “When It Was Now”, available on February 19th, and you can pre-order your own copy now on iTunes. You can also download a free song off of their new album on their website. It’s funny to think that the guys of Atlas Genius were known mainly as a cover band for almost three years and now they’re on their way to being covered by other bands. With a colorful groove, stirring beats and catchy melodies, it’s hard not to like them. Try them out for yourself and they might become one of your favorites, too. For some bands, it’s all in the timing. Atlas Genius stuck it out through the drought and now they are riding upon a deluge that is carrying them around the world, and picking us up along the way. The band will be touring the US extensively throughout 2013, with a stop in Nashville for 3rd & Lindsley’s “Nashville Sunday Night” on June 9. If the first leg of their tour is any indication, you may want to get your tickets well in advance as every show has sold out thus far. With their debut album “When It Was Now” out on February 19, we’ll be hearing quite a bit from these Aussies for years to come.